Background: The synthesis of novel Mannich bases of nitro alkanes utilizing mono- and diamino sugar is abundant in the literatures. The new bases have been successfully synthesized and fully characterized. Biological investigations, particularly cytotoxic activity of our novel compounds were made against some cancer cell lines. With an attempt to improve the anticancer activity we decide to include the indole moieties (well known as anticancer agent) along with nitro function. Method: Investigation of the synthesized derivatives and studying their cytotoxicity against a range of cancer cell lines; such as Hep G2 (liver hepatocellular carcinoma), PC3 (human prostate cancer cells), HCT116 (human colorectal carcinoma), MCF-7 (breast cancer cell lines) and A549 (human lung carcinoma) revealed an inhibitory effect ranged from potent to weak activity in comparison with Doxorubicin; a well-known currently used drug for treatment of several types of cancer. DNA-damage determination was further explored for HepG2 cell lines that previously treated with the most active derivatives using Comet assay (SCGE). Results: Accordingly some compounds showed good activity against A-549 and HepG2 cancer cell lines in comparison with the well-known cytotoxic drug [Doxorubicin]. As a result the current research introduces novel compounds expected to serve as lead structures of potential therapeutics for cancer. Conclusion: The present paper deals with Mannich reaction of nitro methane and/or nitro ethane with formaldehyde and well known sugar mono-/di- amines result in novel nitro-heterocycles polyhydroxy Mannich basses of type 4, 5 and 9-12. Some new polyhydroxy nitro-Mannich basses have been investigated for its reactivity such as reduction, acetylation and condensation afforded structures variety. Indole ring has been introduced with the nitro functional to enhance the anticancer activity through some condensation reactions with nitro alkanes. The synthesized compounds have been confirmed by different means of analytical and spectral data. Biological investigations, particularly cytotoxic activity of our novel compounds were made against some cell lines [A-549, MCF-7, HCT-116, HepG2 and PC3], in comparison with the well-known cytotoxic drug [Doxorubicin] to discover their impact as new inhibitors in cancer therapy. 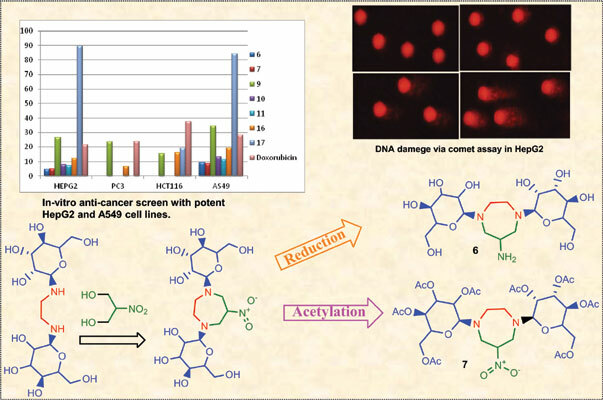 DNA-damage determination was further explored for HepG2 cell lines that previously treated with the most active derivatives 6 and 7, using Comet assay (SCGE). As a result of all preceding examinations, we introduce novel compounds which expected to serve as lead structures for new series of potential therapeutics for cancer. Keywords: Mannich reaction, bis-glycosides, D-glucamines, anticancer activity, HepG2 and A549, comet assay. Keywords:Mannich reaction, bis-glycosides, D-glucamines, anticancer activity, HepG2 and A549, comet assay. Abstract:Background: The synthesis of novel Mannich bases of nitro alkanes utilizing mono- and diamino sugar is abundant in the literatures. The new bases have been successfully synthesized and fully characterized. Biological investigations, particularly cytotoxic activity of our novel compounds were made against some cancer cell lines. With an attempt to improve the anticancer activity we decide to include the indole moieties (well known as anticancer agent) along with nitro function.